Not sure what to look for in a new apartment? We'll tell you the main things to consider when you first start checking out new apartments. When it comes to location, you'll want to know the obvious criteria, such as distance to campus and neighborhood safety. But you'll also want to know how far it is from the nearest grocery store, laundromat, convenient store, and other fun stuff like bars, theaters, etc. You'll be spending a lot of time in your bedroom, so make sure to inspect it closely. Things to keep in mind are closets, windows (with blinds? ), and the location of outlets. Also, make sure to actually imagine how you might layout the room with a bed, desk, and dresser. Once a queen mattress gets in there, it may seem a lot smaller all of a sudden. There's a relatively short list of amenities to ask about, but they can really make or break an apartment, so make sure to ask. When asking about Parking, you need to know about spots in a driveway or nearby lot, but also local laws regarding street parking. Another big one is Laundry. Is it in the unit or basement? If so, is it free or coin-op? And if there isn't a machine in the building, where's the nearest laundromat? Lastly, are there any Included Utilities with the unit? Of all the utilities you'll have to be paying for, what are the average prices over the last year? Dishwashers are also always nice, so keep track of those, too. When you’re looking at the common area, you will want to know beforehand what you plan to use it for. You may plan to use the space mostly for inviting friends over, watching tv, studying or relaxing. Will there be enough space for what you need? Where is it located in relation to the rest of the apartment/house? Is it too close to the bedrooms? Will noise be an issue? At every apartment, go into a bathroom, and turn the shower on. Hold your hand under the water, and think about two things: how quickly is it getting hot, (a minute might be fine but 5 is just inconvenient), and what's the pressure like? Nobody likes a weak shower! Kind of a yes or no thing, but make sure they're around. Not every apartment will have an A/C unit, but you may want to ask if the landlord could provide them or you can bring your own. It's not that long, and you're in college. You can read. No excuses, here. Keep an eye out for clauses about guests, sublets, pets. Is it a huge turn off that there's no laundry in the basement? Tell the landlord! They will often agree to add amenities or make repairs in order to get you to sign. Just be honest! Grab the phone number for current tenant. You can call later and ask about the landlord. Responsive? Charges fees for late rent? Also, make sure to ask about any furniture they may be leaving behind! 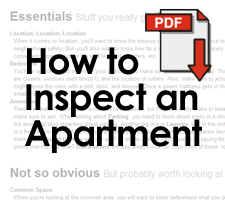 It can be hard to remember everything you want to check, so print out our apartment inspection checklist or write one yourself for things you care about. It also makes things a lot easier when sharing this info with roommates.